1. Cut chicken crosswise into 1/8″ thick slices. Combine lemon juice, chopped rosemary and ½ tablespoon of olive oil in a bowl. Pour mixture over chicken slices to marinate, coating evenly. Cover and refrigerate while you prepare the rest of the ingredients, or marinate overnight for best results. 2. In a blender, combine ½ cup sliced strawberries, remaining oil, balsamic vinegar, salt and pepper. Blend to incorporate flavors. Taste and adjust as needed. 3. Heat a skillet over medium-high heat. Drizzle water onto skillet. When water sizzles, place chicken, along with the marinade, on the skillet, and cook 3 minutes on one side. Flip and cook 2 more minutes, or until the chicken is no longer pink. 4. Divide spinach between 2 big plates. 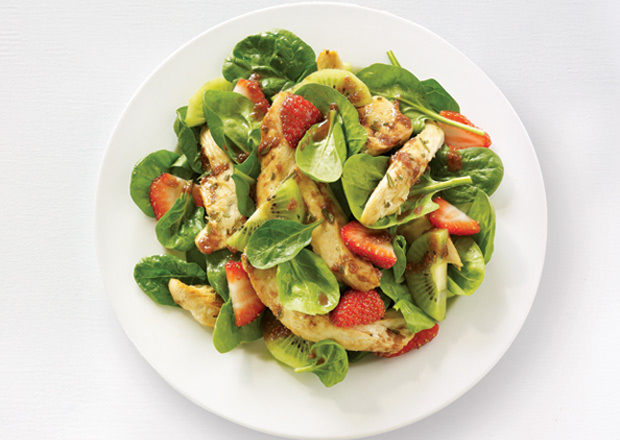 Top each plate with cooked sliced chicken, remaining strawberries and sliced kiwis. Drizzle with dressing. Serve.